Vast, sprawling vineyards, a state-of-the-art winery, a sleek minimalist guesthouse of contemporary architecture; accompanied by large quantities of vino. Two days at the Fratelli winery in Maharashtra were a lesson in wine and passion, and their Indian connection. A short two-hour plane ride to Pune and the ensuing three-hour drive to Akluj in the Solapur district of Maharashtra, makes the Fratelli winery a hop, skip and jump away from the hustle and bustle of Delhi. But for a mere five-hour-long commute, the landscape changes dramatically - traffic is replaced by deserted roads and the noise by silence that's almost deafening. Free from the usual cacophony of shouts and blowing horns, this getaway from the city was long overdue. 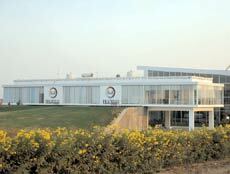 I was on my way to witness brand Fratelli's workstation - the laboratory churning out what is being touted as the next big brand on the Indian wine market. After Sula, Grover and Champagne Indage, Fratelli is the newest player in the country. Created by master wine-maker and viticulturist Piero Masi, and owned in partnership by three sets of brothers - Andrea and Alessio Secci from Italy, the Sekhri brothers Kapil and Gaurav from Delhi and the Mohite-Patil brothers Ranjitsinh and Arjunsinh from Akluj in Maharashtra, this unique outfit clearly takes the concept of 'brotherhood' quite seriously, and rightly so. After all, fratelli does mean 'brother' in Italian, and this trans-continental fraternity is driven by passion and a challenge to alter the image of wine in a country that still perceives it as 'foreign'. Coming back to the task at hand, I was apprehensive to say the least. Not being much of a wine connoisseur myself, I was expecting to be schooled in what I thought would resemble rocket science. But over the course of the next two days, I was pleasantly surprised. Unlike their wines, the approach to the winery is imposing, amidst the arid nothingness. What seems like a white dune from the distance, comes into focus as a larger-than-life 'Fratelli' spelt out in bold white concrete. The structure of the guesthouse and winery seems to embrace the environment with a concrete white spine and glass body structure designed by architect Sunil Patil. We were greeted by Alessio, who was down from Italy on his second visit that month. After freshening up, we sat down to a late lunch (cooked by our hosts) during which Alessio's plate remained largely untouched as he answered our myriad questions about the decisions leading up to the mammoth investment of starting a winery. "It was the result of an evening of high spirits", he told us. "We just really wanted to make it work. So it took us a while to get the funds in order, and yet longer to find the right space for the vineyards, but after a lot of research and planning, we were on our way." The next day started with a tour of the winery, located on the same property and just adjacent to the Fratelli guesthouse where we were staying. Alessio was busy with a buyer so Arjunsinh filled in. Listening to the assorted brothers talk about winemaking is much like watching a doting housewife cooking dinner for her family, albeit in something that resembles a spotless fivestar kitchen. 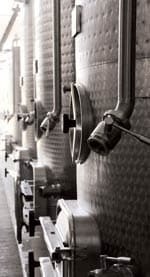 The 58 gleaming tanks in the winery stand tall in neat rows and at the time of crushing the grapes, they are connected by a pipe to the single crusher outside. Within, a raised ramp network allows access to the cauldrons from above. The bottling plant is housed in a separate room divided by a passage-soon to be adorned by the works of upcoming artists in time for wine tours-and churns out 1600 bottles per hour, stamped with a single grapevine accompanying the imposing company logo. We were patiently taken through the entire process, from when the grape- rushing begins, till when the wine is bottled, labelled and stored away in the cellar below at a precise temperature of 18 degrees Celsius. The sheer labour that goes into wine-making made me appreciate every sip I took during dinner later that evening. What I found refreshing was the easy, natural mingling that set the tone through my visit. Rather than being a sales pitch, their campaign starts and ends with the wines. Unlike other Indian wine-makers who churn out new wines in volume, this fraternity follows the 'less is more' school of thought. 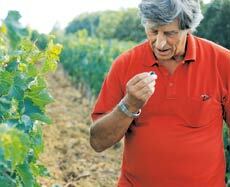 "A good wine is made in a vineyard, not in the winery", says Alessio Secci. To this end, they have a collective 240 acres of vineyards distributed over their three sites at Motewadi, Nimgaon and Garwad, where they've planted 13 distinct varieties of grapes sourced from France. This was to be our next destination, and after a short drive to the vineyards, we were more than ready for lunch. A small group of five, including two members from the Fratelli family and their representative, our diverse backgrounds seemed to mix reasonably well as we sat under a thatched gazebo of sorts, atop a low hill overlooking a wide vista of green veins running through a muddy terrain for as far as the eye could see. Of course, the view wasn't all that we'd come to enjoy, as there was also the picnic to consider - hot rotis, rice pulao, spicy home-made chicken, yellow dal and masala aloos - accompanied by half-topped goblets of Chenin Blanc, Cabernet Sauvignon and Sauvignon Blanc. Though not quite your typical Italian meal of pasta in red or white sauce, the spread at hand juxtaposed the wines in an interesting balance. And if the Secci brothers of Fratelli Wines can have their way, our glasses of water are soon going to be replaced by glasses of wine! After much over-eating (and drinking), we accompanied Alessio on a vineyard trail, all the way down the same green veins we'd seen earlier. The lasting silence of our surroundings was punctuated by an occasional drumroll accompanied by a shooing sound made by workers posted at spots across the expanse. We learnt that the purpose of this was to shoo off birds that make a beeline for the vines. Not long after, our lunch was digested, and we were only too happy to start munching on the different varietals of grapes, trying to grasp their distinct flavours and answer Alessio's pop quiz on the nuances of each variety. The perfectly ripe bunches were ready for the last harvest of the season, and Alessio was schooling us on why some of the grapes were already shrivelled while others needed a few more days to reach their optimum flavour depending on the angle of the sun, the shadows cast by the hillslope etc . It seems improbable that just four short years ago, this lush hillside was rocky, barren land. Explaining how the vision became a reality, Alessio said, "We did a lot of testing, over and over. 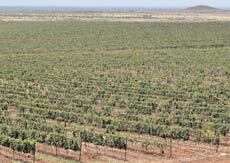 But in the end we knew the land would be perfect for grapes, albeit after a lot of work. It took some trial and error before we realised which varietals would thrive in this soil and which would just not take to it." As proof of their experimentation, there is still a patch planted for Pinot Noir, which turned out to be a miserable failure and will be replaced by a different grape this year. "Kapil loves his Pinot Noir, he insisted that he wanted to make it along with the other varietals, so we thought we'd give it a shot." That was not to be, but their specialty is the low-yield plant. Rather than squeezing the most out of each wine, they have made a conscious decision to obtain the optimum amount and stop right there. 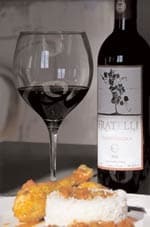 As compared to other winemakers who obtain 15,000-20,000 tons per hectare, Fratelli limits the quantity to 10,000 tons. The result, they say, are wines of a higher, finer quality. The guesthouse and winery in Akluj. This attitude to winemaking clearly sets them apart from the multitude of winemakers in the country; the heart they put in it, and their almost emotional drive behind the venture. After all, they've sunk their life's savings into it, so the obessessiveness makes sense. We'd had a long day and it was our last night at Fratelli, so our hosts went the whole nine yards and prepared a fitting send-off. Back at the guesthouse grounds a roaring bonfire took centrestage out front, while we sat decked out on thick mats and enjoyed some local entertainment which consisted of ten men doing a hop, skip, jump, round-and-round routine while piping out some vaguely familiar Bollywood tunes from little trumpet-like instruments. Of course, we were watching glass in hand, eating some freshly barbecued quail and tandoori chicken Akluj-style. And though the bar that last night was well-stocked with whisky, vodka and beer, not one of us reached for anything other than the wines; you could say we'd been converted! Four years, a few roadblocks, much experimentation and several combinations down the line, last year saw the public launch of the first batch of this Indo-Italian venture. Currently distributed in Mumbai and Pune, Fratelli wines will soon be made available in the North, once they obtain their license. India's popular wine connoisseur Magandeep Singh thinks they currently make the best wine India has to offer, and even back home in Italy their wine has been appreciated at blind tastings by experts. The Fratelli family's ultimate ambition is to place their bottles on the tables of Indian homes, and though they've managed to make a splash so far with their quality wines, it remains to be seen where they go from here.